V.Gerasimov. 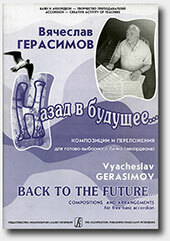 "Back to the Future..."
Vyacheslav Gerasimov was born 6 January 1941 in Krivoy Rog city (Ukraine). His first musical experience became playing domra in Children Art Palace orchestra. And then... Then the piano accordion was bought at the market. At that time there were no piano accordions manufactured in Russia, all of them were trophies from the Second World War. The impression from the accordion was such powerful, that Vyacheslav decided to learn how to play it. His first teacher was V. E. Stoletny - piano player from the cinema, who was talented improviser. After two years of studying accordion Vyacheslav decided to study accordion professionally, but it was impossible. At that time in Soviet Union piano accordion was accepted as a musical instrument of bourgeois culture. It was considered that Vyacheslav should continue his education playing bayan (russian system accordion). In 1956 Vyacheslav entered as a student the Leningrad musical college named after by M. P. Musorgsky. During his study at the second half of studying he tried to work professionally at the Leningrad concert agency called Lenconcert. In 1960 Vyacheslav Gerasimov became a student of Moscow institute of music named after by Gnesinykh, and in 1961-1965 he is the student of Leningrad state conservatory. In 1965-1966 Vyacheslav Gerasimov served in the Ensemble of Song and Dance of Leningrad military region. Since 1966 to 1981 he worked in Lenconcert, performing frequently with folk choirs, accompanying folk singers. Since 1963 up to the present time Vyacheslav Gerasimov works as the accordion teacher in Saint-Petersburg musical college. Vyacheslav Gerasimov is well-known teacher, author of various methodical works, composer whose compositions and arrangements became popular among accordion players.